Engineered wood products have transformed the manufacture of upholstered furniture to the benefit of both manufacturers and consumers. Furniture-grade wood products allow manufacturers to attain higher material yields, reduce assembly costs, and deliver quality furniture that will stand up to the demands of a lifetime warranty. Engineered wood products like OSB, plywood, and structural composite lumber (SCL) are popular with upholstered furniture manufacturers for a variety of reasons. Wood products’ structural benefits and manufacturing flexibility result in quality furniture at a reasonable cost, resulting in increased yields for an environmentally-friendly boost to profit margins. APA-trademarked products can often be locally sourced. Shorter shipping time and tighter inventory control means keeping your money in the bank and not in your warehouse. Dependable availability of quality products from a nearby mill means it's easy to source materials that meet manufacturers' exact specifications at just the right time. Often times, these locally sourced products help the local community and those who work there as well. In upholstered furniture, quality matters. 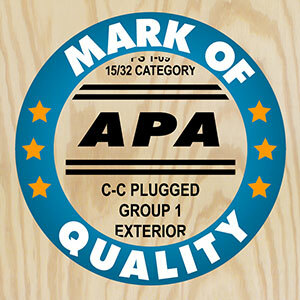 The APA mark of quality is the manufacturer's assurance that the product conforms to the standard shown in the trademark, and is subject to APA's rigorous verification and testing. Many imported panels do not undergo such thorough product qualification testing. Without such tests it is impossible to determine how the panel will perform for the intended use. As an internationally-accredited testing laboratory, APA put imported hardwood plywood panels up against panels qualified to PS 1. Test results of the imported panels indicated inferior mechanical and connection properties and severe failure of bond durability – and only one tested sample would have met the formaldehyde limits imposed by CARB, compared to domestic plywood certified to PS 1. The Association’s trademark appears only on products manufactured by member mills and is the manufacturer’s assurance that the product conforms to the standard shown on the trademark. Plywood, OSB, and SCL are readily available and cost-competitive when compared with traditional hardwood lumber. This allows the manufacturer to better control the costs of its finished product and to pass those savings onto the consumer. Large panel sizes means that wide components can be made in one piece, which results in significant labor savings and better quality frames. Due to the high yield of plywood and OSB, there is very little waste. This cuts down on cost because the majority of the panel can be utilized. The high yields from OSB and plywood are not only an advantage for cost-effectiveness—this also means a benefit to the environment, as there is less wood being wasted than with hardwood lumber. Plywood offers twice the yield of hardwood lumber. Some manufacturers even report yield improvements from 30 percent with hardwood frame-grade lumber to 90 percent with plywood. Imported composite wood that isn't tested or qualified to known product standards has raised serious concerns about formaldehyde and its impact on indoor air quality. But APA Rated plywood and OSB panels are sourced locally and have been exempted from U.S. EPA and California formaldehyde regulations due to their very low emission rates. To learn more, visit our formaldehyde page. Furniture-grade panel properties, such as strength, fastener-holding capacity, consistent yield, stability, and workability, lend themselves well to the structural demands of quality furniture manufacture. Due to their durability and strength, panels improve the overall quality of furniture. The uniformity of the product eliminates any need to replace split or warped lumber components and is ideal for notched joints. Large panel sizes improve manufacturing efficiencies and are ideal for working with Computer Numeric Control (CNC) panel saws and routers. Furniture-grade panels are engineered for their intended end use, allowing the manufacturer to take advantage of their strength and fastener holding capabilities. Panels are dimensionally stable, which makes them less likely to warp or twist. Reliability of wood structural panel components helps reduce service calls and therefore increases customer satisfaction. 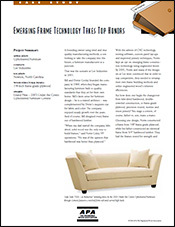 This case study features a North Carolina furniture manufacturer that has converted 65 percent of its frame production to engineered wood, gaining frame strength and faster assembly times.